After 22 games this season, O.J. 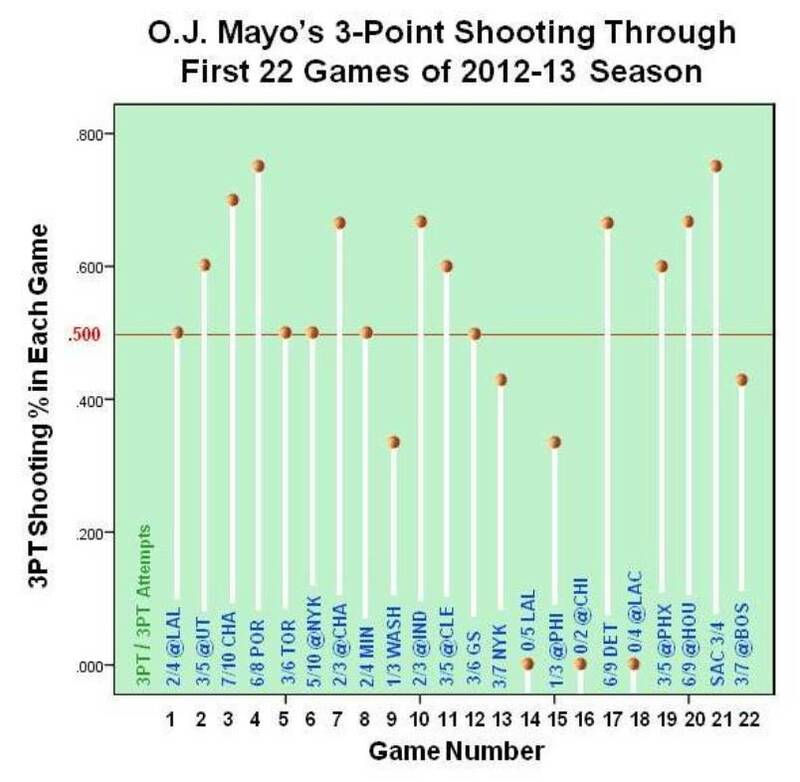 Mayo of the Dallas Mavericks is currently hitting three-pointers at a torrid .525 percentage (64-of-122). The New York Knicks' Jason Kidd actually leads Mayo slightly in this statistical category, .527-.525, as of this writing, but Kidd has taken roughly 50 fewer shots than Mayo from downtown. Mayo's career shooting percentage from behind the arc, based on four seasons with the Memphis Grizzlies before this fall's arrival in Dallas, is .388. That's an excellent success rate, but this season he's taking his outside game to a new level. In looking at the list of annual NBA leaders in three-point shooting percentage, there have been some players who have managed to maintain a hit rate of .500 or greater for a full season. Most recently, Kyle Korver shot .536 (59-of-110) from long-distance during the 2009–10 season and Jason Kapono, .514 (108-210) in 2006–07. However, these percentages were achieved on a lot fewer shots than Mayo would be projected to take over the entire season (roughly 450), based on his shots per game thus far. Taking number of shots into account, arguably the most impressive three-point shooting season since the NBA introduced the trey in 1979-80 was by Glen Rice in 1996-97, when he shot .470 (207-of-440). Whether Mayo can surpass Rice's percentage -- or better yet .500 -- over a comparable number of attempts, of course, remains to be seen. 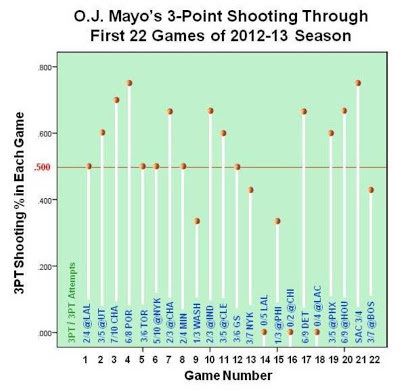 The first graph shows that Mayo hit 50% or more of his three-point attempts in 11 of his first 12 games this season, the only exception being a 1-for-3 outing against Washington in Game 9. He then went into a brief slump, including three games in which he missed all of his attempts from behind the arc (.000 percentages). Lately, however, he's gotten pretty hot again. The second graph shows his cumulative three-point shooting perecentage after each game. 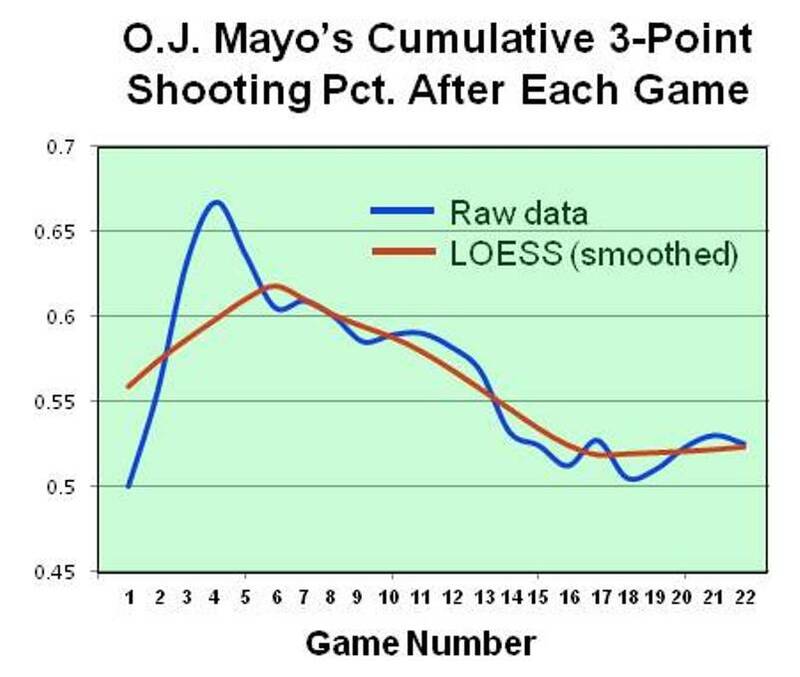 Let's focus first on the blue curve, which presents Mayo's actual raw data. Mayo went 2-for-4 in the opening game, hence the blue curve is at .500 on the vertical axis. He then shot 3-for-5 in the second game, giving him a combined 5 made threes on 9 attempts, for a cumulative percentage of .556 after two games. His peak cumulative three-point shooting percentage thus far came after four games, at .667 (18-for-27). *TECHNICAL POINT: The official name of the smoothing technique is loess (also known as lowess) regression, which refers to "local" estimation in different segments of the sequence. Further information on the technique is available here and here (the second article links to a free downloadable Excel add-on to do loess regression). Loess regression requires the user to submit a value for what is called the "smoothing parameter." With a low value, such as .25, the smoothed curve really does not get too smoothed out at all, closely following the twists and turns of the data (i.e., the loess curve is highly sensitive to tiny changes in the trend being plotted). In contrast, a smoothing parameter of 1.0 generates essentially a straight line, showing very little sensitivity to small ups-and-downs in the raw data. I ultimately chose a .50 smoothing parameter, which is at the high end of what the Excel software add-on said was the typical range. **UPDATE: In the Mavericks' 23rd game of the season, tonight at Toronto, neither Mayo nor any of his Dallas teammates made a three-pointer. Quoting from the game article: "The Mavericks went 0 for 13 from 3-point range, coming up empty for the first time since February 1999. Their stretch of 1,108 games had been the longest active streak in the NBA."